Significance of Varmala Ceremony - The First Step To A New Life! Home Hindu Marriage Significance of Varmala Ceremony – The First Step To A New Life! Significance of Varmala Ceremony – The First Step To A New Life! Different cultures have different ways of celebrating this spotlight-occasion. 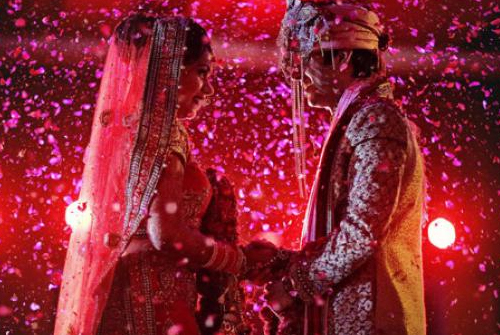 The Indian way of marriage is well-known throughout the world as one of the most extravagant and lavish ceremonies. Its charm and brilliance draw people even from other parts of the world to celebrate their one and only best occasion in the Indian way. Varmala is not just a fancy ceremony, instead, is considered to be an integral part of any Hindu wedding. This ritual has also been mentioned in Vedic literature books of ancient times. It can be otherwise named as Jaimala. 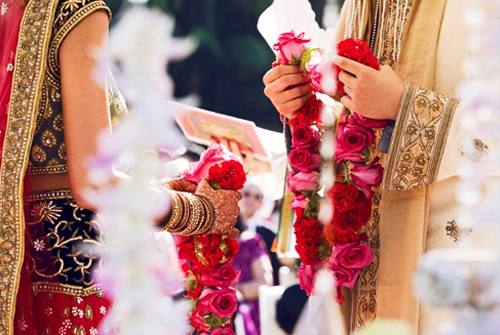 Varmala means exchanging of garlands by the bride and the groom. It is made of fresh and pious flowers. In ancient times it was believed to be the acceptance ritual by the bride and the groom for the marriage. Even in Gandharva Vivahs, the marriage of celestial beings, the marriage was sealed by the exchange of garlands. The ceremony holds huge significance. The ceremony has its origin from Vedas where it is believed that Hindu Gods and Goddesses performed the same ceremony at the time of their wedding. In the past, a girl used to choose her groom by putting a garland around his neck in a ceremony called Swayamwar. A mention of this is made in many old scriptures and epics. In Ramayana, Sita had put a garland around Lord Ram’s neck after he breaks the bow which is a symbol of her accepting him as her husband. In Mahabharata, Draupadi chooses Arjuna to be her husband by garlanding him. The exchange of garlands takes place as soon as the groom arrives along with his baraat. The groom and his relatives and friends are first welcomed by Bride’s family with flowers and various rituals are performed on the doorsteps. In many parts, the mother of the bride puts tilak on the Groom’s forehead and welcomes him by doing aarti with a puja thali in her hand. Finally, when groom reaches the stage he awaits his bride and as soon as she arrives on stage the first ceremony that takes place is the Varmala ceremony. According to Vedic literature, the bride garlands the groom first which shows that she has accepted him as her husband. Then the groom puts the garland around her neck depicting that he has accepted her as his wife. The garlands are kept properly even after the wedding as they are considered to be pious and pure. Next articleIndian Wedding Reception – The Bride Introduction Ceremony! Inter Caste Marriage valid or not! Explained by Bhagavad Gita.